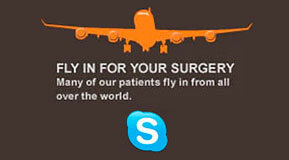 Burn injuries account for over 100,000 hospital admissions per year. The most common age groups are toddlers (age 2 through 4) and adolescents (age 17 through 25). Injuries to the head and neck account for approximately 50% of all burn injuries. Burn Plastic Surgery Patient 1: This patient had tissue expansion, with scalp reconstruction, as well as reconstructive surgery on her eye and cheek to create a more natural and normal appearance. Notice the symmetry of the eyes that was created with a ptosis repair, midface lift and lower eyelid reconstruction. With the opening of many specialized burn centers for acute burn injuries, death rates from severe burns have dropped significantly. Survivors are often left, not only with functional impairment (e.g., drooling, neck contracture, corneal exposure, nasal airway blockage, lip incompetence), but also with a grotesque facial appearance and distortion of facial expression. Doctor Jacono specializes is facial reconstructive surgery to not only improve the function of the face (speaking, chewing, eyelid opening and closing, and ability to move the head and neck) but also to restore the appearance to a more normal aesthetic. 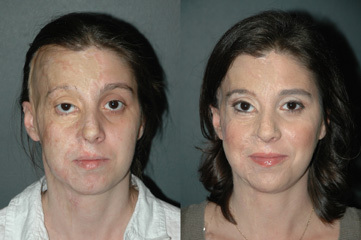 Skin grafts are used by conventional plastic surgeons to replace burn-damaged skin. The thin grafted skin often leaves a “patchwork,” expressionless face. The skin texture is ropey, thickened and irregular, lacking facial animation. 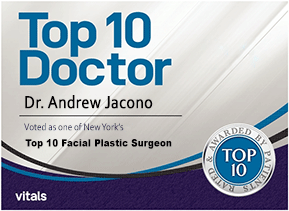 Doctor Jacono incorporates more advanced methods of burn reconstruction and uses facial flaps (tissue flapped or transferred from other parts of the face head and neck), skin expanders, laser technology, and custom corrective make-up matches to achieve the most complimentary surgical outcomes. Although disfiguring burn scars can not be “erased” in their entirety, generally significant improvement can be achieved in cosmetic appearance and functional activities of everyday life. 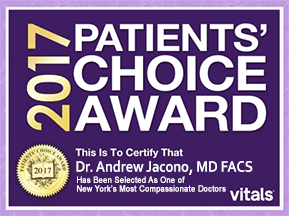 While there are no absolute guarantees, Dr. Jacono can make visible changes in every case.